As compressed air systems are crucial for industrial and commercial operations, air compressor maintenance is therefore essential too. Compressor maintenance ensures the upkeep of your air compressor and that it continues to operate efficiently and effectively. Neglecting the air compressor maintenance routine may poison the entire air system which may subsequently lead to various other problems. The pressure of the compressor must be at its highest level to ensure it is functioning efficiently. If there are any leaks in the distribution piping, or a contaminated dryer heat exchanger, it may cause the lowering of pressure at the time of operation. Moreover, the malfunctioning of a compressor air dryer may bring water into the pipelines. Therefore, it is necessary to change the compressor air dryer when it is required. The air compressor must be turned off before servicing. The cleanliness of the compressor oil must be maintained. The oil must be changed according to the manufacturer’s suggestions. High quality oil must be used in the compressor and sampling must be carried out every month. Retain the cleanliness of air inlet filters. Keep the motor belts tight to lessen leakages in the compressor. The improper pressure switch setting may lead to excessive load per hour ratio. This can be rectified by adjusting the setting in accordance with the manufacturer’s specifications. 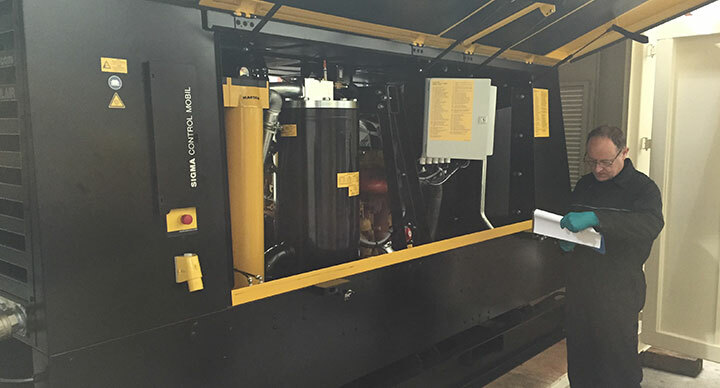 Glaston offers air compressor maintenance for a number of branded products, including KAESER air compressors and HPC compressors. The restricted airflow can be remedied by cleaning the cooler exterior and checking of inlet filter mats. The level of the oil can be maintained by checking the compressor level regularly and adding oil if necessary. Finally, the restricted flow of oil can be rectified by removing the restriction or changing any necessary parts. The above points clearly delineate some basic problems of air compressors and how regular air compressor maintenance can keep the system running efficiently and effectively. For more information about our compressor maintenance service, or any of our product ranges, including nitrogen generators, please contact us today.